This course guide compiles pharmacy and psychology resources relevant to PHRD 518. Welcome to the research guide for PHRD 518: CNS Disorders! This guide compiles library and web resources that will be useful for your coursework throughout the semester. Use the tabs above to navigate through the various resources. If you have any questions, please contact a librarian (see contact info to the left). Have a great semester! 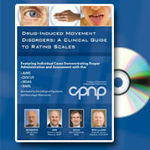 Drug-Induced Movement Disorders: A Clinical Guide to Rating Scales by Stoner, Steven C., Kalachnik, John., Sommi, Roger W.
Note: This item is a DVD. Two copies are available in the media collection on the first floor of the library.